8. How Good is Good Enough? 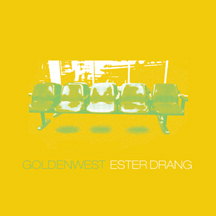 The tracks on Goldenwest are intricate compositions with ghostly melodies and pulsing, moody jams. These are well thought out rhythm and guitar based songs that come out full, filling the room with a washed and airy grace. The electronics nestle into the mix perfectly, the band masterfully avoiding any hint of overindulgence. Influences from My Bloody Valentine, Marvin Gaye, Spiritualized, Mogwai, Phillip Glass, Echo and the Bunnymen, Boards of Canada. Oklahoma’s Ester Drang is all of these, while being none of these.